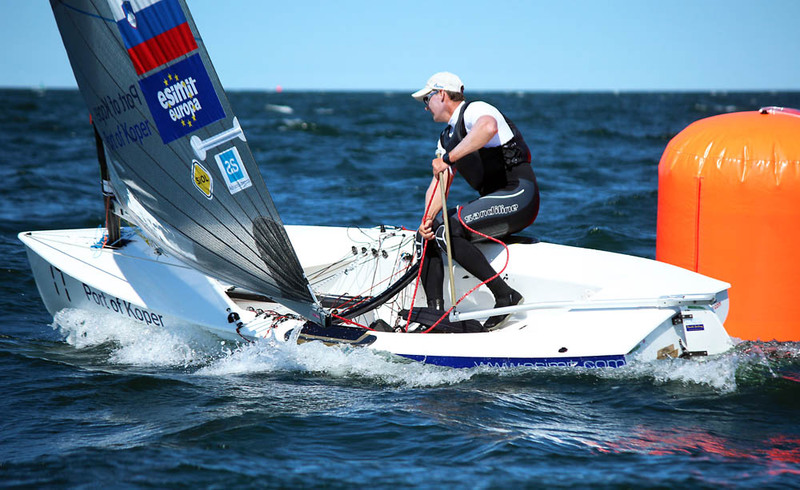 Vasilij Zbogar (SLO) is the early leader at the 2013 Finn Europeans in Warnemünde after three races were sailed on Tuesday. Ivan Kljakovic Gaspic (CRO) is second after winning the first race while Andrew Murdoch (NZL) is third. Other races wins went to Deniss Karpak (EST) and Josh Junior (NZL). The sailors patience from waiting onshore all day Monday paid off with three great races sailed on Tuesday. 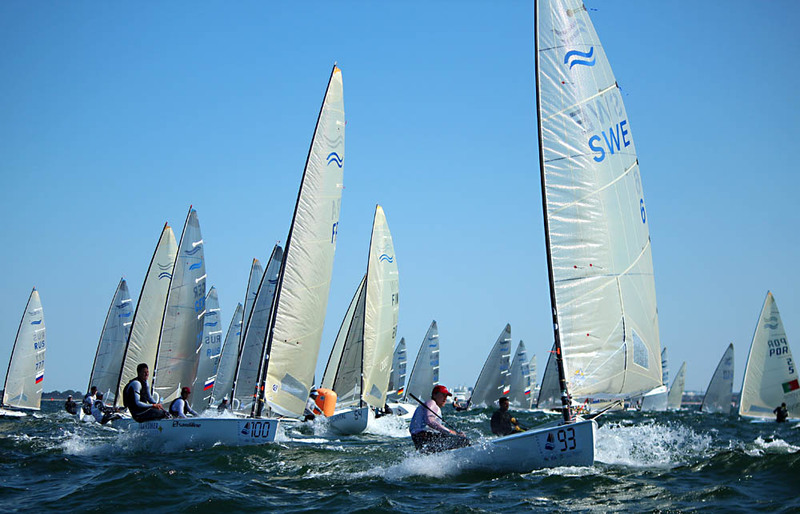 The first race was sailed in a reducing easterly, while the two afternoon races were sailed in a fantastic sea breeze that produced the great sailing conditions that has made Warnemünde famous with sailors worldwide. Race one got under way at the fourth attempt after two postponements and one general recall. Five boats got pulled out on the final start, under black flag. Some thought the the left would pay with the building thermal, some gambled on the far right, and the spread of the fleet with 103 boats was quite incredible. Even a small shift at that distance provided some incredible leverage on the other side. However, it was from the middle left that the leaders emerged. Vasilij Zbogar (SLO) rounded ahead from Filippo Baldasaari (ITA) and Max Salminen (SWE). The wind was starting to go lighter and dropped to from 10 to 6-7 knots by the finish. Zbogar kept the lead downwind and even extended slightly but on the second beat Zsombor Berecz (HUN) moved ahead and Ivan Kljakovic Gaspic (CRO) closed the gap. By the final top mark Berecz had pulled through to lead but it all changed again on the final downwind with Kljakovic Gaspic finding a way past both to win the race from Zbogar, Berecz and Thomas le Breton (FRA). Race two took a long while to get going as the first attempt was abandoned as the fleet rounded the top mark following a series of major wind shifts. After a 30 minute wait the sea breeze stabilised and the fleet got away first time. The race two restart belonged to Denis Karpak (EST). Starting just down from the committee boat and tacking out to the right he controlled the race from start to finish. The wind was up to 12-14 knots making for perfect racing confirms. Second at the top mark was Peter McCoy (GBR) from Ed Wright (GBR). Karpak again led round the top mark in race three but lost out downwind on the right and rounded the gate in fifth. Junior, Murdoch and Zbogar were to the left and gained places to round the gate ahead. Junior maintained his lead round the final top mark with Andrew Mills (GBR) working his way into third. 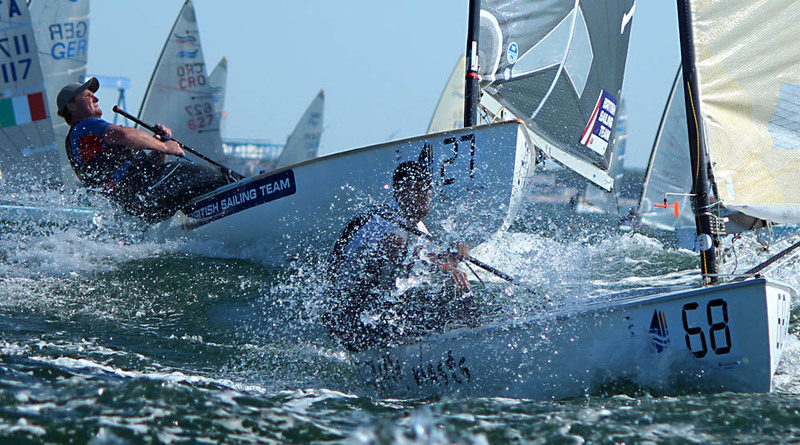 Not much changed on the downwind to the finish except Jonathan Lobert (FRA) moved up to third, while Junior took an emphatic victory. Lobert said of his day, “Finally we have some racing. The first race was a little bit difficult because the wind was a bit up and down. So I was not sailing so well and I didn’t managed to get the good pressure on the water so not so good race and then sea breeze came in and we had two good race sin about 15 knots which was good fun and slowly slowly I was improving so not too bad at the end of the day. Zbogar, “The day was quite hard, especially the beginning as the first race was so light. And very shift and I managed to play very good shifts up the first upwind and I finished second which is those conditions is extremely good. Then we had a pretty nice breeze, very strong. I had a problem in the second race. I was ahead of the fleet and the halyard block came off and the sail came down. I lost about 25 places, and I really struggled to come back. I managed to finish seventh so I got a countable results when I thought I wouldn’t finish the race. And the last race as great. My downwinds are extremely good, and I was playing the waves very well. It was hard but it was a good day. The championship is still one race behind but has three great races on the card. But for his halyard problem, Zbogar could have an even bigger lead. In this size fleet consistency will pay highly and he is finding his way through the shifts and sailing very well downwind. The double European Champion Kljakovic Gaspic is in second while class newcomer Murdoch is third. It was a long day on the water but it was also a fantastic day’s sailing. What the rest of the week will bring only time will tell as the forecasts do not make good reading. However the race team hope to catch up the schedule with three races planned for Wednesday. This press release was sent to you by the International Finn Association.